Recognising the value of effective training for operators of robotics, ENGEL UK in Warwick have installed a dedicated robot training cell for their range of 6-axis robots. 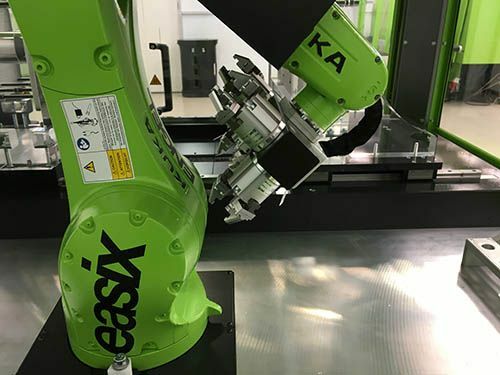 An investment of €140,000 in a simulated injection moulding machine with ENGEL “easix” multi-functional articulated robot has enabled the company to provide world-class training for team members from injection moulders throughout the UK and Ireland. The complete training cell has a fully integrated ENGEL CC300 Control Unit which allows complete manufacturing cells to be controlled according to tasks, such as mould changing or according to functions, such as insert placement. The Engel “easix” multi axis robot is evolved from a standard articulated robot to provide excellent performance for plastics processing in part unloading and insert loading. It provides the user with high levels of flexibility, intuitive graphical sequence creation and the potential for advanced applications.